My First Coach goes behind the scenes to explore the unique relationship between quarterbacks incuding Peyton and Eli Manning, Tom Brady, Jim Harbaugh, Joe Montana, John Elway, and Phil Simms, and their fathers. Brady's father is an estate planner. Harbaugh's father had a long career as a college coach. Archie Manning played 14 years in the NFL and never made the playoffs, but his sons Peyton and Eli have combined to win four Super Bowls. Montana is considered by many to be the greatest quarterback of all time, but his two sons bounced around college football with limited success. Jameis Winston's father supported his family working overnight highway construction in Alabama. Derek Carr's father moved the family to Houston after Derek's older brother, David, was drafted by the Texans. It also investigates the various approaches to parenting through their stories, including these questions: Can young athletes overcome helicopter parents? How did the kids with NFL aspirations deal with their fathers who'd already made it? What kind of pressure did they have to overcome? What kind of pressure did the father who succeeded put on his son to be an athlete? Would the expectations be lower and the results greater if the father was an attorney or doctor? Was it better for he fathers to be overearing, or borderline disinterested? 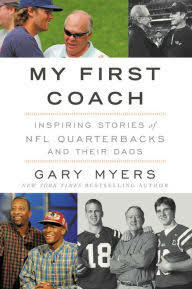 Myers writes, "My First Coach explores the important relationship between quarterbacks and their fathers. It provides many life lessons for boys and girls and mothers and fathers through the experiences of some of the best-known and most interesting quarterbacks of this generation. "What parent can't relate to working their schedule around driving their kids to baseball, football, basketball, and soccer practices and games? Or sitting in the stands trying not to make it too obvious which kid is theirs? "Every parent knows the anxiety of not seeing their son or daughter on the field and thinking the coach is being unfair. It is not limited to kids with minimal athletic ability. Joe Flacco, who would go on to become a first-round draft pick and Super Bowl MVP, couldn't get off the bench at Pitt and had to transfer to Delaware. Joe Montana's older son, Nathaniel, barely played in high school. "There is more than one way to raise a quarterback. Some fathers want to be involved in every aspect of their sons' athletic lives. Some like to coach. Others take a step back. Even others are overbearing - confronting coaches and complaining about playing time. Indifference is not a trait I found in football fathers. Indifference is not what their sons wanted. "The closeness of the Brady family became evident on the Monday night of Super Bowl LI week in Houston in 2017. Brady was asked who his hero was. "As he was answering, Brady became choked-up and teary-eyed." Myers continues on what his book hopes to achieve and another anecdote on Tom Brady, Sr., and his son, the Patriots quarterback, "My First Coach is not just about the fathers who coached their sons on the field; rather, it's actually more about how they coached them off the field and taught them how to succeed in football and in life. "Sometimes, a dad just being a dad works out better than even the most supportive father could have planned. What can result in greatness? Athletic skill is required, of course, but supportive parents who can put their child in the best position to succeed are essential. But there are different formulas that work, as My First Coach illustrates. Often, there is even more frustration from the parents than the quarterbacks if they are not on the field. "Brady, Sr. still holds a grudge against Michigan coach Lloyd Carr for the way he felt he mistreated Tom. Carr redshirted him his freshman year in 1995, then Tom threw only 20 passes as a backup over the next two years. The Wolverines won the national championship with Brian Griese at quarterback in '97, so it's hard to second-guess Carr's decision. Clearly, Brady was not yet the Brady who has won five Super Bowls. "Brady started all twenty-five games, putting together a 20-5 record, in his last two seasons at Michigan, but even so, Carr put Tom in a position where he was constantly forced to look over his shoulder at top prospect Drew Henson. Carr got Henson into seven games in 1998, often just for one series to give him experience and keep him happy. Carr began the 1999 season by having Brady play the first quarter, Henson play the second, and then decide at the half who would play the rest of the game. Eventually, he scrapped that rotation and Brady played all the time. "Brady has played for Bill Belichick, the best coach of this era. But the best coach of his life is also his hero and his best friend. His name is also Tom Brady. He was his first coach." My First Coach is the perfect Christmas gift for your parents, especially if they're football fans and can relate to these stories and appreciate their part in playing youth sports.